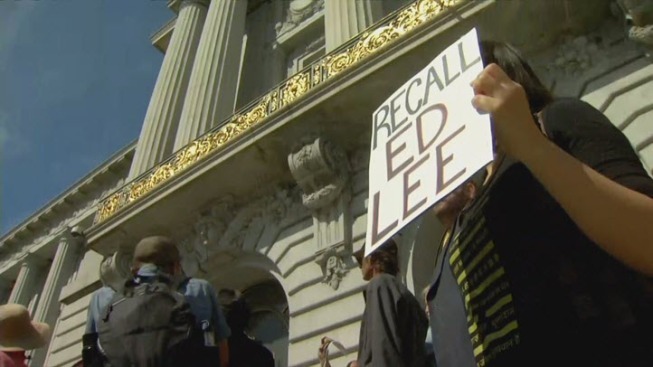 A group of protesters looking to recall Mayor Ed Lee rallied on the steps of San Francisco City Hall Friday. Protesters said they are frustrated with issues ranging from Lee's handling of homelessness, rising housing prices and fatal police shootings. "He has forced middle- and low-income families out of San Francisco to benefit developers, big business," said Yayne Abeba with the Committee to Recall Mayor Ed Lee. The protest was met with counter protesters who showed up in big numbers, triggering a shouting match. A group called Stop the Wasteful Recall Coalition said a recall would cost taxpayers $3.5 million. Recall organizers were undeterred, and said they are waiting for approval from the Department of Elections to begin gathering an estimated 40,000 signatures needed to start a recall election.